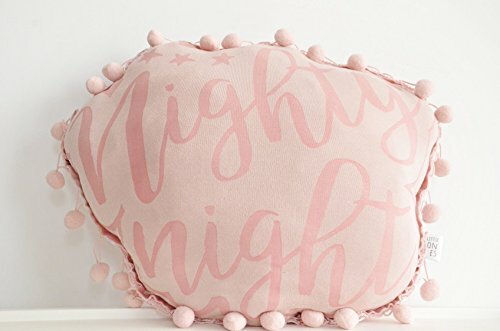 This adorable handmade "Nighty Night" (pink) pillow designed from 'LittleOnes' is just the perfect gift for your precious little ones, family and friends. the soft and smooth cushion is cut to fit the "Nighty Night" phrase shape with big pom pom trim all around, comes filled with a comfy cushioning to make it very cuddable! sawn and silk printed by hand, one by one, with safe water-based environmental-friendly colors. It can go in your kid's room or your baby's nursery, but it will also look great in the bedroom, living room or where ever you so fit to your home's design. The decorative super soft and cozy pillow will create a modern look in any room. ▸ Pillow Textile Front- soft tricot fabric made of Viscose and Lycra. Back- pique fabric. Frame- big pom pom trim. ★ handmade silkscreen printing with water based colors. Stuffing: Acrilan, polyester fibres. ▸ Shipping: Please allow up to 5 days Before shipping. Each Pillow comes in a uniq package, sent carefully by registered post. You will find more information about shipping and payment in my shop's policies. ✱✱✱ PLEASE NOTE - these are intended for decor purposes only and are NOT to be used as a toy due to small pieces. Keep out of reach of children under 3 years old. If you have any questions about this product by DesignedByLittleones, contact us by completing and submitting the form below. If you are looking for a specif part number, please include it with your message. Sew Cute by Me Designs Original Birth Announcement Pillow for Baby Girls Nursery - Footprints - Includes Personalized Pillowcase and Pillow Insert 14"x14" or 16"x16"